An actor reference is a subtype of ActorRef, whose foremost purpose is to support sending messages to the actor it represents. Each actor has access to its canonical (local) reference through the self field; this reference is also included as sender reference by default for all messages sent to other actors. Conversely, during message processing the actor has access to a reference representing the sender of the current message through the sender field. Purely local actor references are used by actor systems which are not configured to support networking functions. These actor references cannot ever be sent across a network connection while retaining their functionality. 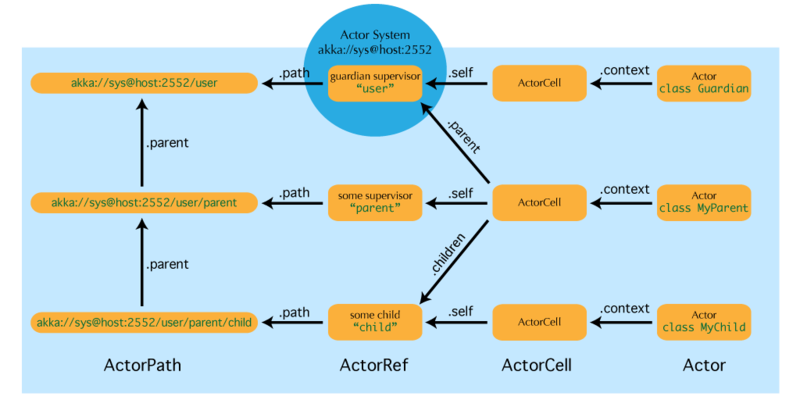 Local actor references when remoting is enabled are used by actor systems which support networking functions for those references which represent actors within the same JVM. In order to be recognizable also when sent to other network nodes, these references include protocol and remote addressing information. Remote actor references represent actors which are reachable using remote communication, i.e. sending messages to them will serialize the messages transparently and send them to the other JVM. PromiseActorRef is the special representation of a Promise for the purpose of being completed by the response from an actor; it is created by the ActorRef.ask invocation. DeadLetterActorRef is the default implementation of the dead letters service, where all messages are re-routed whose routees are shut down or non-existent. EmptyLocalActorRef is what is returned when looking up a non-existing local actor path: it is equivalent to a DeadLetterActorRef, but it retains its path so that it can be sent over the network and compared to other existing actor refs for that path, some of which might have been obtained before the actor stopped existing. (Future Extension) Cluster actor references represent clustered actor services which may be replicated, migrated or load-balanced across multiple cluster nodes. As such they are virtual names which the cluster service translates into local or remote actor references as appropriate. Here, akka is the default remote protocol for the 2.0 release, and others are pluggable. The interpretation of the host & port part (i.e. serv.example.com:5678 in the example) depends on the transport mechanism used, but it must abide by the URI structural rules. While the logical actor path describes the functional location within one actor system, configuration-based remote deployment means that an actor may be created on a different network host as its parent, i.e. within a different actor system. In this case, following the actor path from the root guardian up entails traversing the network, which is a costly operation. Therefore, each actor also has a physical path, starting at the root guardian of the actor system where the actual actor object resides. Using this path as sender reference when querying other actors will let them reply directly to this actor, minimizing delays incurred by routing. In order to be able to replicate and migrate actors across a cluster of Akka nodes, another level of indirection has to be introduced. The cluster component therefore provides a translation from virtual paths to physical paths which may change in reaction to node failures, cluster rebalancing, etc. This area is still under active development, expect updates in this section for the 2.1 release. While local and remote actor references and their paths work in the same way concerning the facilities mentioned below, the exact semantics of clustered actor references and their paths—while certainly as similar as possible—may differ in certain aspects, owing to the virtual nature of those paths. Expect updates for the 2.1 release. An actor system is typically started by creating actors above the guardian actor using the ActorSystem.actorOf method and then using ActorContext.actorOf from within the created actors to spawn the actor tree. These methods return a reference to the newly created actor. Each actor has direct access to references for its parent, itself and its children. These references may be sent within messages to other actors, enabling those to reply directly. 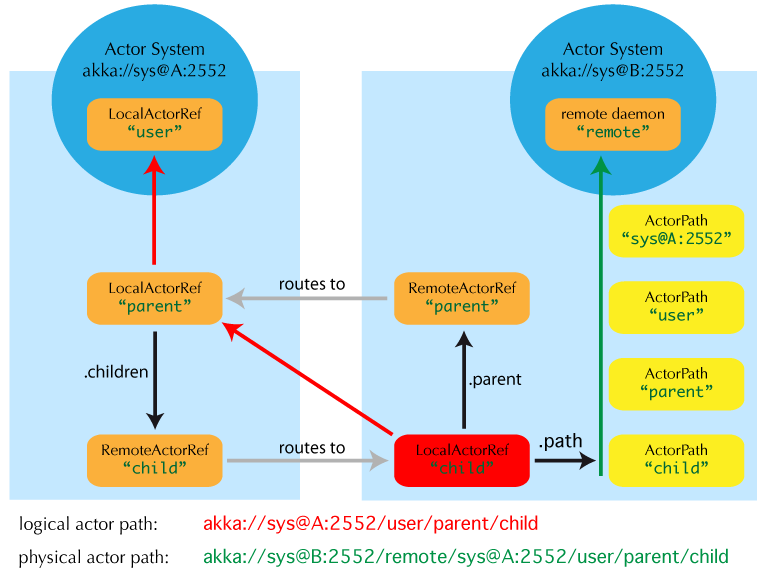 In addition, actor references may be looked up using the ActorSystem.actorFor method, which returns an (unverified) local, remote or clustered actor reference. Sending messages to such a reference or attempting to observe its liveness will traverse the actor hierarchy of the actor system from top to bottom by passing messages from parent to child until either the target is reached or failure is certain, i.e. a name in the path does not exist (in practice this process will be optimized using caches, but it still has added cost compared to using the physical actor path, which can for example to obtained from the sender reference included in replies from that actor). The messages passed are handled automatically by Akka, so this process is not visible to client code. actorFor only ever looks up an existing actor, i.e. does not create one. When an actor is terminated, its path will point to the dead letter mailbox, DeathWatch will publish its final transition and in general it is not expected to come back to life again (since the actor life cycle does not allow this). While it is possible to create an actor at a later time with an identical path—simply due to it being impossible to enforce the opposite without keeping the set of all actors ever created available—this is not good practice: remote actor references which “died” suddenly start to work again, but without any guarantee of ordering between this transition and any other event, hence the new inhabitant of the path may receive messages which were destined for the previous tenant. When creating a scaled-out actor subtree, a cluster name is created for a routed actor reference, where sending to this reference will send to one (or more) of the actual actors created in the cluster. In order for those actors to be able to query other actors while processing their messages, their sender reference must be unique for each of the replicas, which means that physical paths will be used as self references for these instances. In the case of replication for achieving fault-tolerance the opposite is required: the self reference will be a virtual (cluster) path so that in case of migration or fail-over communication is resumed with the fresh instance. "/user" is the guardian actor for all user-created top-level actors; actors created using ActorSystem.actorOf are found at the next level. "/deadLetters" is the dead letter actor, which is where all messages sent to stopped or non-existing actors are re-routed.